The CNA salary in Rhode Island will largely depend on a workers time on the job, experience level and city they are employed in. While Rhode Island is a relatively small state, they do hire a lot of CNAs and are anticipating hiring more in the future. The amount of salary that is offered to a Rhode Island-based CNAs usually depends on the number of years of experience they have providing hands-on care. Location also impacts salary as CNA jobs in small towns or rural areas tend to pay less than those in city areas. In the United States, the average salary hourly salary for a CNA is around $12.02. The average annual salary for a CNA is $23,726. In the state of Rhode Island, according to Indeed.com, the average salary for a CNA is about $12.55 an hour and they can earn an average of $28,045 a year. To get a batter gauge of a CNAs salary in Rhode Island, check out the following list from Salary.com. It shows the average annual salary that CNAs get in nine Rhode Island cities. As you can see, being a self employed CNA in Rhode Island offers the best pay grade. An experienced CNA who becomes self employed is usually hired to provide special care for sick, invalid, or elderly patients in the privacy of their home. A self employed CNA can earn around $10-18 an hour. To become a successful self employed CNA in Rhode Island, you are going to need to have had some experience in providing in-home care via an agency or to have been employed in a hospital or other big health facility where you can gain hands-on skills before branching out on your own. 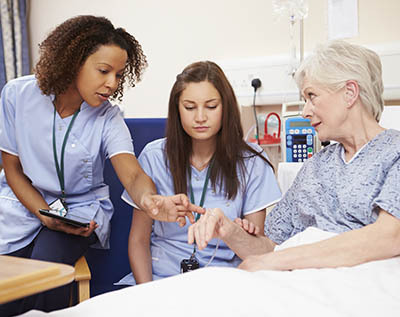 The hospitals of Rhode Island are also major employers of certified nursing assistants. These are the Rhode Island Hospital, The Miriam Hospital, Memorial Hospital, South Country Hospital, Landmark Medical Centre, Newport Hospital, South County Hospital, and Kent Hospital. CNAs should also be able to find gainful employment in home health agencies, adult day care, rehab centres, hospices and nursing homes. Hospices in particular pay quite well, offering their CNAs about $14-17 an hour. Thinking of entering a career in health care? Why not become a certified nursing assistant? As a CNA, you play a vital role in patient care. You will be responsible for providing for daily healthcare needs of a patient. Because you have daily contact with the patient, you will also be tasked with observing and reporting any changes in their condition to doctors and nurses. Your observations will help determine the best care plan for the patient. Visit this page to find the nursing assistant classes in Rhode Island to start toward receiving your certification.